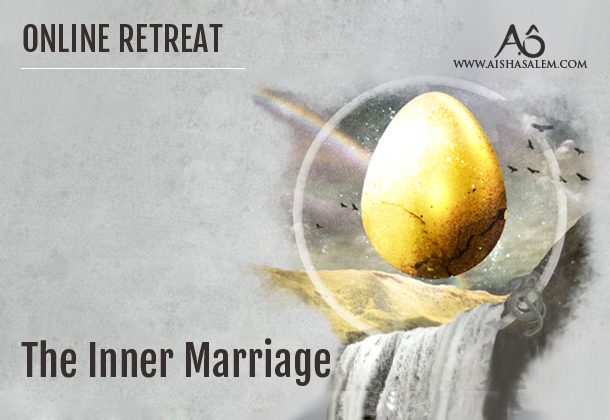 This online retreat on the inner marriage is All About You. You are invited venture with Aisha through a weekend of transmission and sharing on the subtle aspects of reaching the end of the inner fight. The Online retreat invites and guides you strongly towards the attainment of inner balance and harmony in your unfolding as the dance between your inner feminine and masculine. Through clarifications, meditations, enquiry and direct transmission in talks by Aisha, you will attain a deeper understanding and release of the knot-points of misunderstanding in how to move as Love and how to deal with your body in its healing and movement towards wholeness for the unfolding as the True Human. Welcome to another online retreat of Diving Deep with Aisha Salem in sharing, instruction and rewiring of consciousness towards the next and deeper step into your Kindness and Compassion towards yourself as well as the application of your Self in and as Love – for the attainment of True balance. A suggested day-schedule for the online retreat incl. the movement-meditations and contemplations is found within the online retreat space, made available to you at purchase. The Online Retreat takes place via a well-wired online retreat-space, holding all necessary information, which you will get access to immediately after purchase. Recordings are made available within 24 hours after each streaming. The exchange for the retreat is 170 EUR, paid via using the link to the event. See all online events in the Shop.